School is IN! September is the perfect time to check out new school-related scrapbooking products. 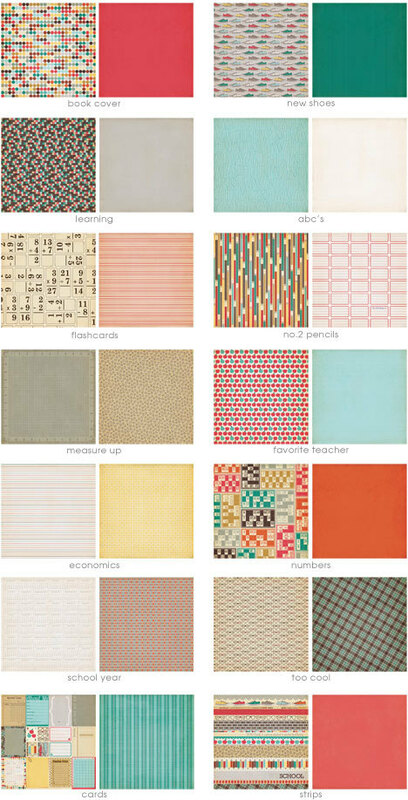 I've always been a fan on Fancy Pants Designs, and the Off to School collection didn't disappoint. 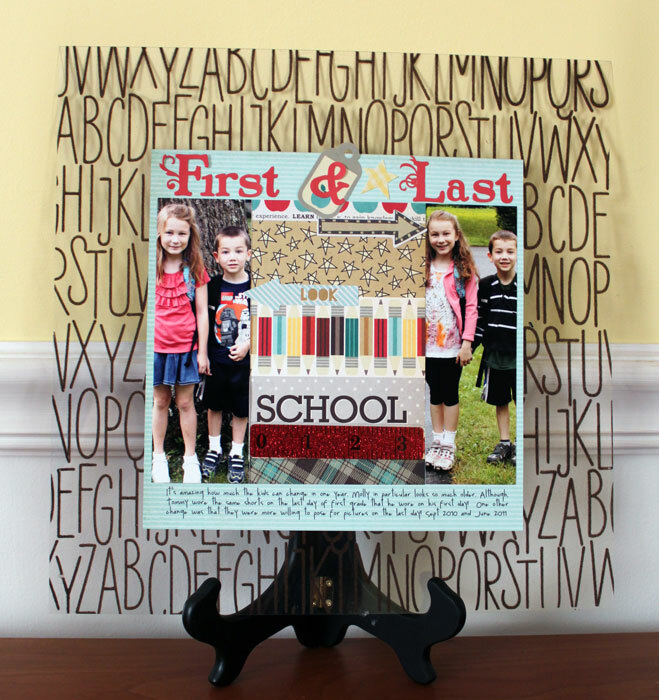 It's a fun mixture of neutrals and bright colors, with school-themed imagery. The collection includes 12x12inch transparencies, along with glitter die-cuts, oodles of stickers and chipboard, and an ephemera pack (love that idea). The stickers include a unique "chalkboard" sticker set that you can write on using actual chalk! - I liked the color palette and the graphic patterns. Of course the fact that they are double-sided means that if you don't like one side, there's another that generally pleases. - I always like when a line includes a strip patterned sheet that combines a number of different patterns on one sheet. You get a lot of variety on one sheet. Ditto for the journaling card sheet. These are options that a lot of manufacturers are doing in their lines these days. - I wasn't wild about all the school-related patterns. There were some that I loved but the sneakers and glasses ones didn't really work for me. I made a layout using the strip sheet of paper, on the alphabet transparency. The flocking on the transparency is a very cool effect. 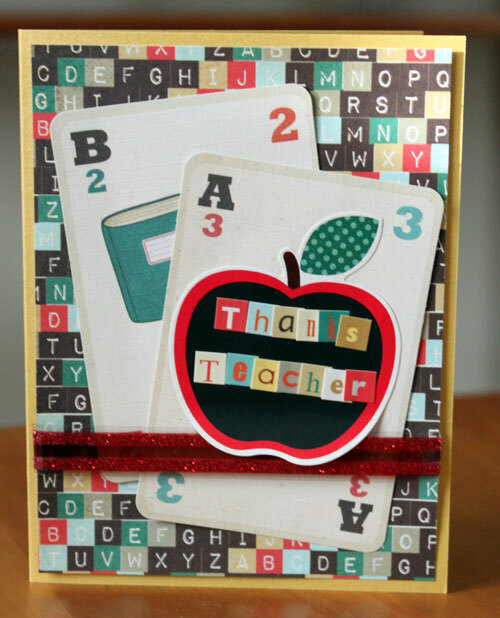 I also made a thanks teacher card. I love the texture of the papers/elements in the ephemera pack. Finally I made a school journaling using the journaling cards/paper along with a variety of embellishments. This was a lot of fun to make and I can see my daughter having a lot of fun filling it up with tid-bits about her school year. i love the chalkboard stickers, and love the paper..
Love what you did with the flocked transparency! Thanks for the chance! Those glitter cuts look fabulous! Love the colors in this line. I love this collection! 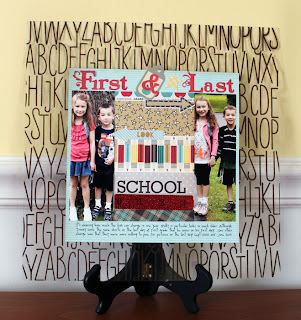 Great colors and images and perfect for all the school years I still have to scrap for my kids! O yeah, I can see mysef using it! I have a 7th grader and I'm a few years behid on his school album! 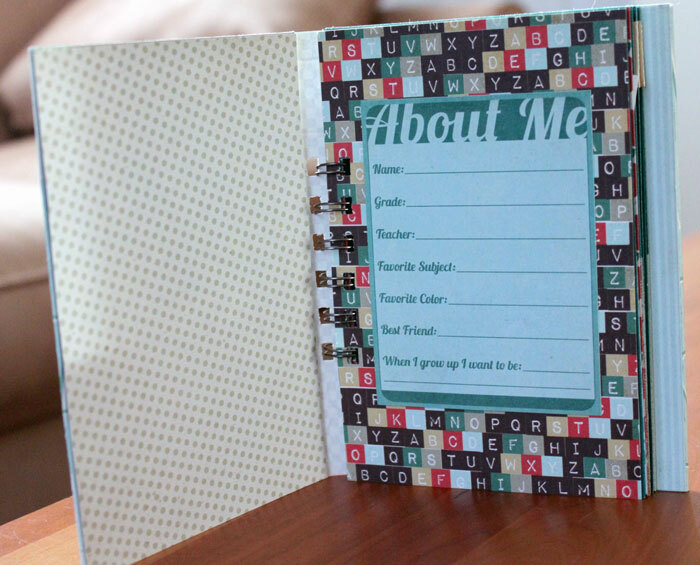 Love the fun book you made for your daughter to document her year.. inspired me to want to make my own for my soon to be 9 year old.. can we say fabulous handmade bday gift for her.. love it.. cute line!! Thanks for the opportunity to snag some goodies!! I really like the way you used that transparency! What I like about themed collections is the fact that the papers are double-sided. Chances are, if one side doesn't work for you, the other one will! So, if I get a school paper that is too kiddish or just doesn't appeal to me, I can flip it around and use the other side! CUTE stuff! The funny thing is, I wouldn't use this for school themed pages, because the colours clash with the school uniforms at my son's school. However, I did use it - for non-school themed stuff. Most of the designs work really well for general boy pages, and I was delighted to find the glasses paper - it was perfect for a layout about my son now needing glasses! love the colors in this line, esp that TEAL! so pretty! 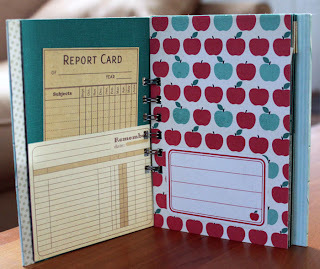 Great mini... my Kindergartner loves little books to practice her writing in... this would be perfect. I like this collection. 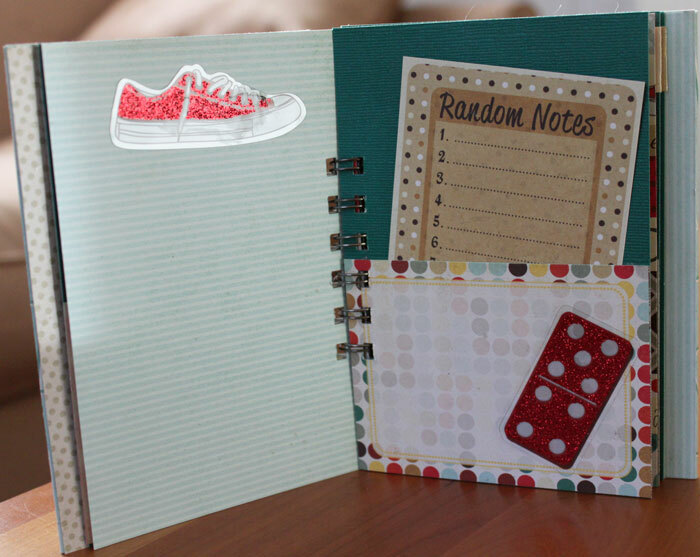 I think it perfect for school related layouts and I love how you used it for the school journal. I love the flocked transparency too, that is WAY cool. I also was drawn to the colors, it is a very pretty palette. Thanks for a chance to win! I love those designs! Stinkin' stinkin' cute! 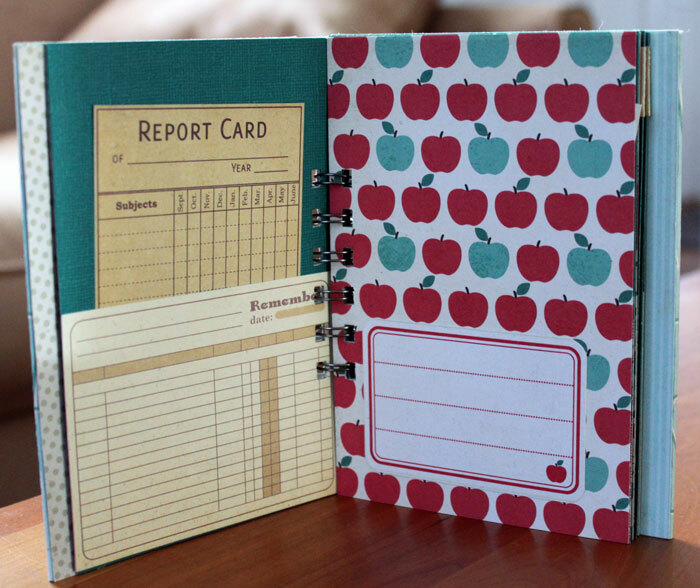 I like it, but do not have much use for a school theme as my kids are grown. 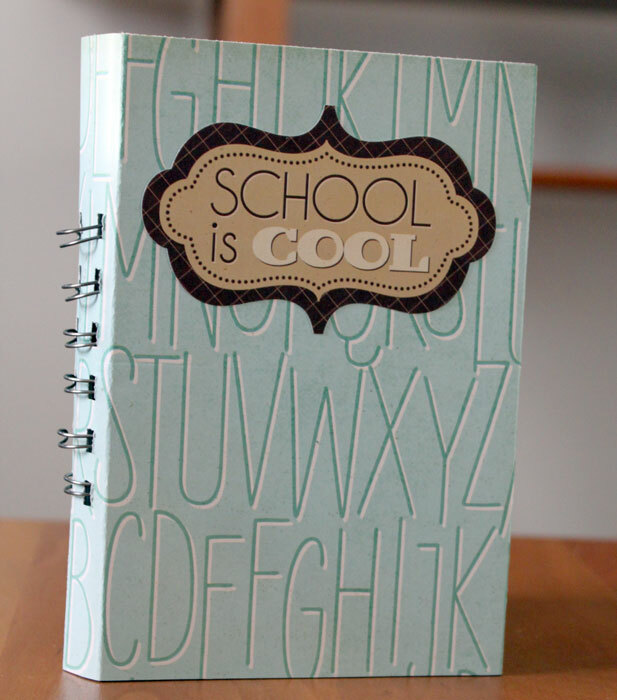 Love the little School Journal you made for your daughter to fill, great idea! I like the colors in this collection - not quite so bright as many school themed collections. Oh, I love this collection. I love the red and black colors and the chalkboard stickers would be so fun to use! I really like the colors in this school line. Super cute! I do like this line. I love that transparency sheet. 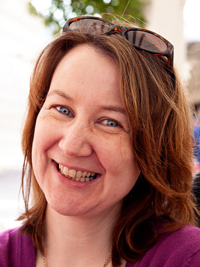 What fun to work with. I like some of the simple patterns that could be paired well together. The chalkboard stckers are awesome! 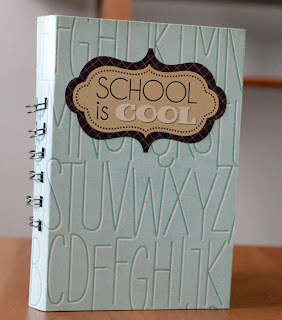 I've been looking for a collection to use for my daughter's school year and I think this is it! Thanks. i LOVE this line! its on my wish list! I love the colors in this collection. School collections always seem to be strictly primary colors, but the muted grays and teals really speak to me. Those chalkboard stickers are awesome and I love the papers. it's hard to find school themed stuff that isnt done in crayon-y colours and this collection has some slightly muted colours. Wow this set is amazing and would be wonderful to complete my children's school pages. I love it all and thanks for a chance to win a set of my very own!! I think it is a cute line! I do not have children right now so I wouldn't really use it for a school theme right now, but it works well for other things too! Love the alphabet transparency and the chalk board stickers best. I have a few pieces of this line and I love it but I am a total sucker for school themed papers. Would love to win some of it...I can see a school mini album in my future, lol! 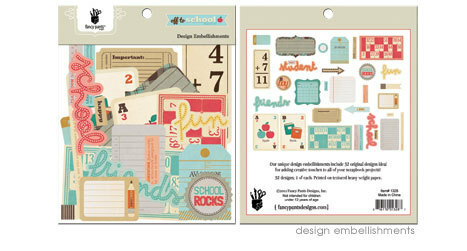 I do like this Fancy Pants line...I love the design embellishments packs that they are making for each collection now! I especially like the embellishments. SUPER amazing projects shared today! I LOVE LOVE LOVE that alphabet transparency! I totally see myself using this line! THANKS for sharing! I really like this line and I even RAK'd some of the fab embellies to a friend but didn't keep any for myself at the time. Love this! The colors are fun and bright and love all of those embellies. Love your layout with the transparency especially. Nice projects! What a cute line. I love the ephemera pack. Thanks for the chance to win!